The effective capacitance of the series combination is 2 μF/10 = 0.2 μF. [If n capacitors each of value C are in series, the effective capacitance is C/n]. The energy of the series combination on charging with the 10 volt supply is ½ CV2 = ½×0.2×102 = 10 J. Therefore, the energy of one capacitor = 10 J/10 = 1 J. The third charge q must be negative so that the mutual repulsive force between the positive charges (Q each, let us say) is counteracted by the attractive force exerted by the negative charge. (3) The figure shows 4 identical parallel metallic plates [(1), (2), (3) and (4)] arranged with equal separation d between neighbouring plates. The surface area of one side of each plate is A and the medium between the plates is air. Alternate plates are joined to terminals T1 and T2 so that the system makes a parallel plate capacitor. Suppose there are n plates (instead of 4) in the system where n > 1 and may be odd or even. What is the capacitance of the system made of these n plates? The lower surface of plate (1) and the upper surface of plate (2) makes a capacitor of capacitance ε0A/d. The lower surface of plate (2) and the upper surface of plate (3) makes another capacitor of capacitance ε0A/d. Similarly the lower surface of plate (3) and the upper surface of plate (4) makes a third capacitor of capacitance ε0A/d. These three capacitors are connected in parallel and the system give a total capacitance of 3ε0A/d. C = (n – 1)ε0A/d. (4) In the combination of capacitors shown in the adjoining figure, what is the effective capacitance between the terminals A and B? On connecting a voltage source between the terminals A and B, the potential at the junction of the two capacitors of value 2C is the same as the potential at the junction of the two capacitors of value 4C. The capacitors of value 8C is therefore connected between equi-potential points and it can be ignored (since it does not get charged). 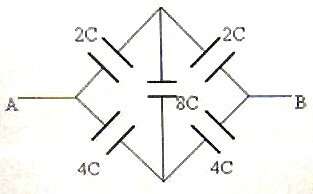 The network thus reduces to four capacitors with the series combination of 2C and 2C connected in parallel with the series combination of 4C and 4C. Therefore, the effective value is C + 2C = 3C. (5) Point charges +2q, +2q and –q are placed at the vertices A, B and C respectively of an equilateral triangle ABC of side 2a. How much external work is to be done to move these charges so that the side of the equilateral triangle becomes a? W = U2 – U1 where U2 and U1 are respectively the final and initial electrostatic potential energies of the system. 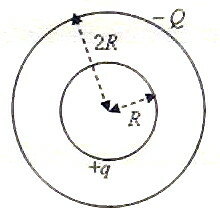 [Note that the potential due to the shell is constant everywhere inside it and is equal to (1/4πε0)(–Q/2R)]. Therefore the answer is simply (1/4πε0) (q/R) – (1/4πε0) (q/2R), which is equal to (1/4πε0)(q/2R). Now suppose we have a conducting sphere of radius R1 carrying a charge Q1 arranged concentrically inside a thin conducting spherical shell of radius R2 carrying a charge Q2. The potential difference between the sphere and the shell is(1/4πε0) (Q1/R1) – (1/4πε0) (Q1/R2), which is equal to (1/4πε0)[(Q1/R1) – (Q1/R2)]. A few hours back I sent my qustion to you. Thank you , I can understand now. While calculating the attractive and repulsive forces I have to think of a free body diagram. Thanks again. Yours is a great site to have concepts of physics.